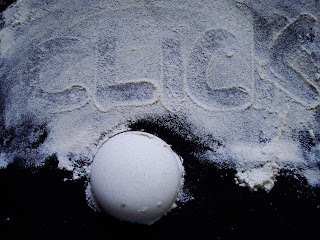 This is my second entry to the Click event..Right from the event announcement for Click-Flour.. i have tried and ended up with flops. this is my fourth attempt. i don't know..how it is going to click for you..but for me it was a Passing Click. there was an ant climbing up this ball of flour..and digging up in. it was reallly a tense moment.if i try to pick the ant..the whole ball will get disturbed.. so i left as it is. i think so That Ant is in love with Click-Event..See that Naughty Ant on the side travelling by the heart in hape. another Click of the ant over the flour ball approaching towards left side. 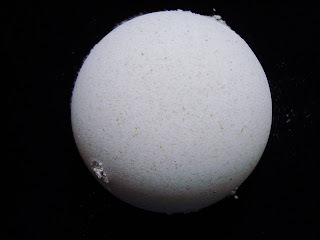 some lines about the concept of having this sphere shaped wheat flour mould. 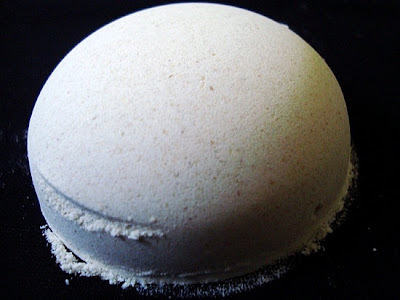 every thing looks better only when it is in proper shape.. i have given this semi-sphere shape for the flour to look better. Wheat Flour looking like Idly(Rice cakes). My entry for WBB hosted by my favourite blog's owner suganya. You all may be familiar with oats porridge. Palm candy, to make the porridge more healthy. sliced apple can also be added to it. those who are dieting can avoid banana and add thin slices of apple to it. 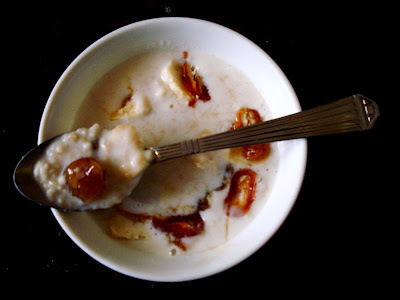 This porridge can also be given to kids..as they may enjoy the sweetness of the palm candy and honey...ofcourse it is a healthy dish with fruits and nuts. iam also sending this for Kid's Food event by Vanamala of Nalapaka. This recipe is one among which i learned from my neighbour..when we were in bangalore. she just made this in minutes..were i kept gazing at her surprisingly..how she could chop the vegetables so fast. (since iam very slow in it). Mix the above all ingredients in the level of order i have mentioned. add lemon juice and salt just before serving. 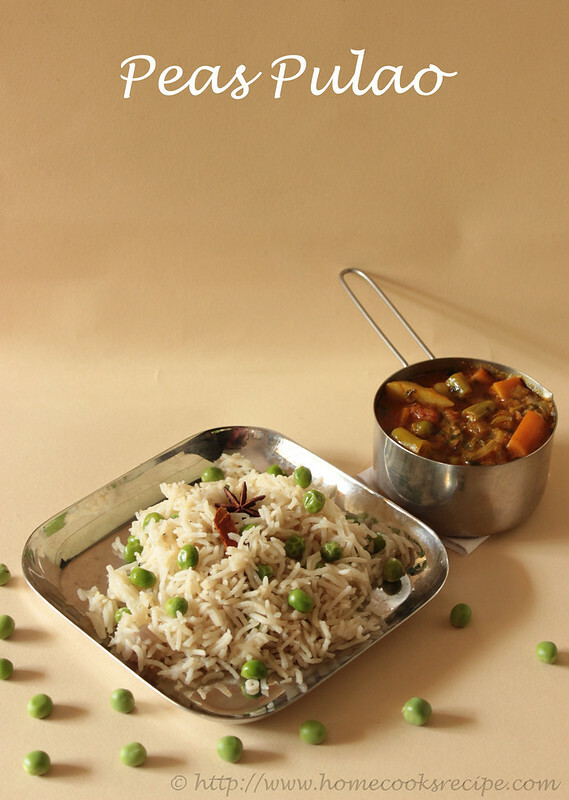 You can also have this as a side-dish for sambhar rice. 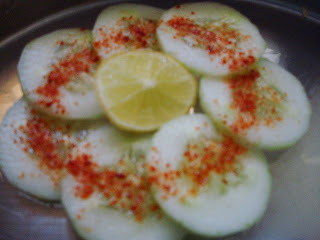 In front of our school..some ladies will be selling cucumber with chilli powder and salt. It would taste so good..No five star hotel salad's could get near them. In a skillet, add 3 spoons of ghee and roast the bread slices till they reach golden colour. Grind the fruits apple,banana and pomegranate along with sugar and half of the milk specified into smoothie. This gives a violet colour smoothie. Now In a skillet add the smoothie along with the rest of the milk and let it boil. Now add the bread slices and mix well.. when the halwa starts sticking to the kadai..add ghee and mix well. I added little kesari colour here..
You can also add grated chocolate here..to make it choco-fruity bread halwa. 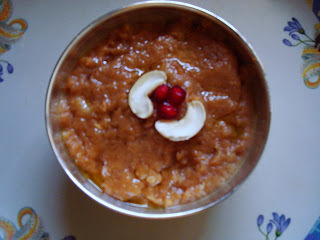 Finally serve it with Ghee roasted Cashews..
Hope You all enjoy this halwa...like we did..
"Yummy blog award is the award given to the blog with most yummy recipes/photos"
Iam Very Happy on my Second Award, "Yummy Blog Award". Thank You Miss Bellevue, Nirmala and Trupti. 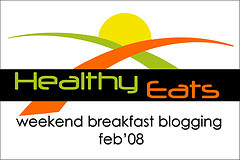 Her Blog is so Nice, do Give a Visit Over there. and I passed these awards to Sowmya, Purnima, KayKat and Cilantro. Thak U Illatharasi for Passing me this Gold Card. Let us be Friends Forever!! Iam Very delighted to receive Nice Matters Award from Dhivya of dhivyas'kitchen, Sowmya of Creative Saga and from Nithu and Shriya of spicytasty. Certainly Dhivya,Nithu,Shriya and Sowmya are all nice Friends and inspire me good feelings everyday when i check into their blog's. 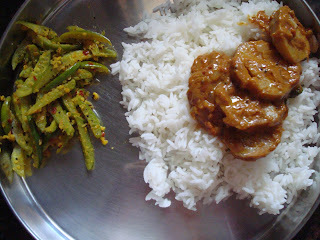 Vaishali..I love her blog as her recipes are Pure vegan and her write up's always influence me a lot. Namratha...Need not Give an intro to her..her recipes are so Good. i hope so her blog would have influenced you all too. Srivalli...she ceratinly influence positive feeling by being so active in this blogger world with her encouraging comments and blog events. I dont know iam worthy enough to pass the award to the above Great People..But For me they are really Nice people. Congrads to all the Award Winner's. Thank You Sowmya, Dhivya,Nithu and Shriya For giving me this boosting pill. Hope It works. How about giving a virtual treat to your blogger friends. dedicating the dishes personally for our blogger friends. Ten days back I saw my Dear friend Shriya of http://www.spicytasty.com/ comment for Raw Mango Pulihothara..where she stated that she wanted to taste it. The above plate is thus for shriya to have her Virtual Treat. iam waiting for you dee..come soon for a virundhu. Well about this dish..When i was pregnant..My husband used to buy several Raw mangoes for me..But i never felt of tasting them. To my surprise in my last trimester..i suddenly over turned to mango side. The above dish was tried by me in those days..near about a year back. My Recipe will be an outlaw from the rules for Mango Rice.. But i assure you it tastes so good. Mix 4 spoons of oil with the rice and let it cool for some time. this makes the rice dont stick with the other. Now In a kadai..add 2 spoons of oil and heat it. add mustard seeds..when it pop up..add chana dal and let it turn golden colour. now add red chilli's, peanut's and curry leaves. roast them well and add sliced onion's. fry it well. add salt and turmeric powder and mix well. now add Grated Raw Mango and Carrot. let them cooked in slow flame for about 2-3 minutes. now add rice and mix well. Serve it hot with mixture. shriya hope you like my Virtual Treat. Why not we Virtually Treat(VT) our Blogger Friends?? Twice or Thrice in a week..I will be cooking greens. i love greens. even if i have been asked to eat greens daily i will eat. well I could not translate the name of the greens from Tamil to english. But here iam giving you 2 Green's Recipes. green had with Tuvar dal..it has its full effect. Next is Thoothu Valai Keerai..As me and My baby got up with cold..we tried up this green..as it cure's cold. Well the recipe for my baby is different from mine. In a kadai..add oil..heat it..add mustard..when it crackles add red chilli and fry it. If you are willing you can add methi seeds and garlic here at this stage. now add sliced onions and fry them. add little turmeric powder and mix well. 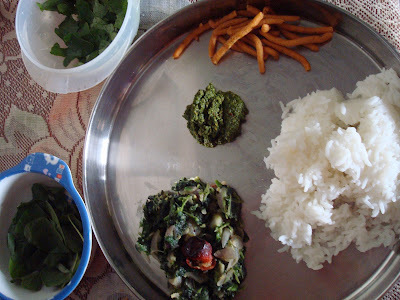 now add the washed greens/keerai. fry them well till the greens leave the water. when they are cooked add salt and mix with the Tuval dal. 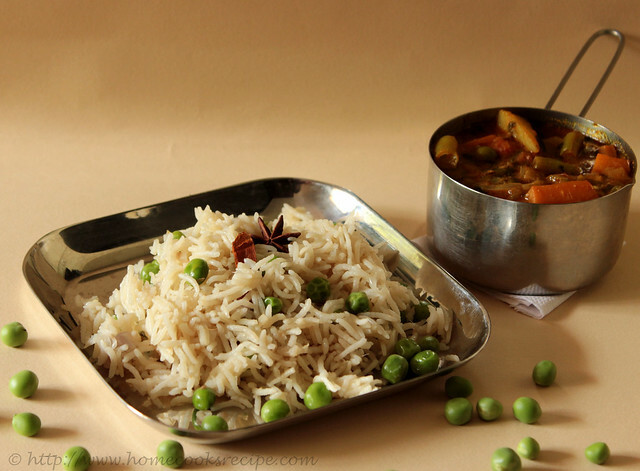 Serve hot with Hot Rice with Ghee. Very Rarely you get this green. This leaf is full of thorn's. so it takes patience to remove those thorn's. But it is very healthy one..If any tamil people reading this post check out this week ananda vikatan edition. varam oru keerai..title. First Roast the dals in a pan and keap it aside. now fry the greens as we fry Mint. after frying..add this to the dals and coconut and salt. grind them coarsely. you can also season it with mustard and saute it again. If you plan for a Quick Recipe, You can select this combo. as it can made with less effort and also it pleases you. For me it took 45 mins. well planning before in hand will reduce this to 30 mins. Wash and soak the Rice for 3o mins. Now In a thick bottommed Pressure Cooker,add 2 spoons of ghee. heat the ghee and add star anice, cumin, pattai, lavang, bay leaf. now add the slice onions and fry it well. let the smell come. now add slitted Green chilli and fry it. add ginger garlic paste and saute it well. now add the drained Rice and mix well with the ingredients in the cooker. add peas now and mix well. you can add milk or coconut milk here at this point. I added milk. add sufficient water and pressure cook it for 3 whistles. 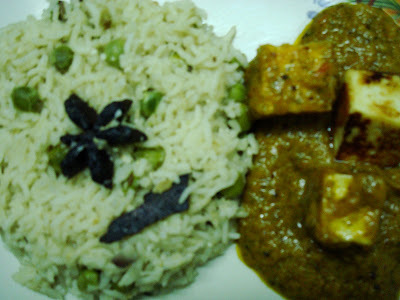 Fry the Paneer in Tava. need not add oil here to fry. frying it for few minutes will do. need not fry them on all sides. leave the fried paneer aside. In a kadai, add oil and heat it. 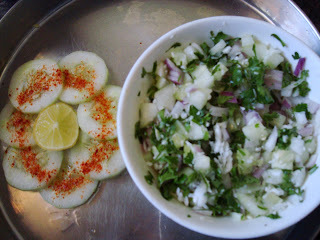 now add sliced onions fry it add sliced tomatoes fry it and add washed corriander leaves. fry them well. they should be transparent. now add little turmeric powder and salt. let them cool. grind them into a paste. (when corriander leaves are added..you can feel a nice smell..too sustain that smell..keap the kadai closed till it is done and cooled). In a kadai. add oil, heat it and add the grinded paste. let them fried and add chilli powder. now mix well and add butter. leave the gravy in slow flame by closing it with a lid for 5 mins atleast. after 5 mins add the fried paneer cubes and mix well. Garnish it with corriander leaves. This gravy is best suited for chapathi's. 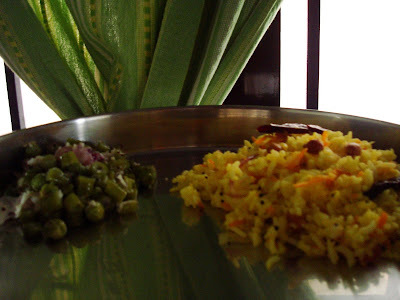 Peas Pulav with Star Anice is leading to Think Spice..Think Star Anice, an event by sunita. My Husband's Favourite Sweet Carrot Halwa. Sweet,Candle Light,Roses and its Fragrances, Cute little angel, My Love...What else I need? This Day is not only for Lover's. It is for the people who are all in love. Today is also Library Day. So Make a Habit of including a book in Your Home Library on this day. Dissolve the sugar in Milk. Let it boil. add the grated carrot and mix well. keap stirring them untill they bind togeather. when they bind add ghee and stir well. 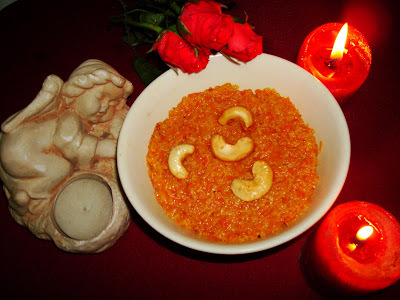 Now garnish the carrot halwa with ghee roasted cashews. This post is on its way to Pooja's Theme of the Week--Valentine's Day. Well..since it is good for health i tend to buy this veggie every alternative week. this ivy gourd is rich in protein and fibre and it prevents certain enzymes which are those to produce glucose in our body. i also prefer each alternative week to buy bitter gourd. i strongly have faith in Food is Medicine. and Health is Wealth. 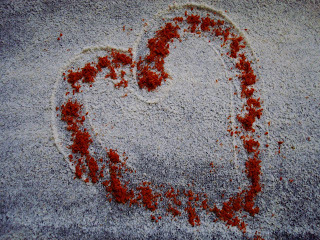 Grind them into a coarse paste..just by sprinkling little water. Cut the Ivy Gourd as you wish..i preferred to cut them vertically as the masala gets absorbed.now In a kadai..heat 5 spoons of oil..add mustard..when it splutters add curry leaves and the grinded masala. fry them for a minute..it soon sticks to the kadai..now add sliced ivy gourd. mix them well with the masala, add salt and turmeric powder a pinch now. mix them and close it. leave them on flame for 10-15 minutes. In between you got to check and keep mixing. Serve with hot rice with a little ghee. Recipe Source: Aval Vikatan.. 30 variety varuval. I was craving for some spicy hotel food..The above combo idea just came as a spark. but i havent tried them before. so on googling i found sailu's cumin rice with rajma. i felt very happy that i could find the recipe for both on a single shot. well iam still in the learning stage with just 3 years of cooking experience. inspite of the above bugs..i still manage to correct it at the last minute and present it to my husband as though nothing occurred. but he will find it out. hope he should have been ratatouille in his last generation. why i was blabbering all the above is..this cumin rice was the first one for me which turned out without any minus marks. 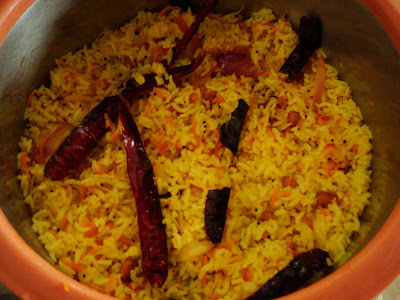 it does'nt mean that i got improvised..it is this cumin rice will not trouble anyone and wont let others down. In a pressure cooker, heat the ghee. add cumin and fry them brown. now add the cumin and lavang powder. fry it. the color changes just in seconds. now add rice. mix well. add water and salt mix well. pressure cook it for 3 whistles. depends on your cooker. This is the first time for me to try out a spicy masala. First have a fistfull of corriander leaves, 6 garlic pieces and 2 inch of ginger and grind them into a paste. now In a kadai, heat the oil, add lavang/cloves fry them well. now add the grinded paste and fry it. add sliced pieces of one onion and fry them. when it is fried add a slitted green chilli and finely chopped pieces of two tamatoes. fry them well. add salt,turmeric powder a pinch, chilli powder a spoon, 2 spoons of corriander powder, 1 spoon of cumin powder, 1 spoon of garam masala and mix well. now add the rajma beans(soaked for 10-12 hours), into the mixture and mix well. add water..see to that in what consistency you require the rajma masala to be in. 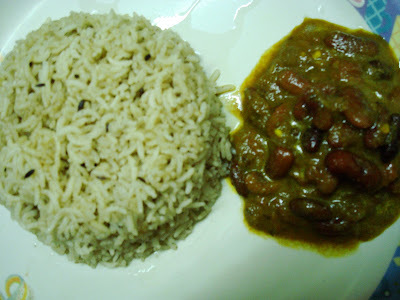 the rajma masala suits well to cumin rice. the below link is of sailu. check out her version. This is one of my favorite veggie. If you have neglected this veggie before this..feel sorry for it. This Suran is a Blood Purifier. Thou it pricks your tongue while eating. It can be avoided using tamarind water when applying masala to it. Being a vegan..I crave to try out the spiciness in the Non-vegetarian food. I prefer this suran roast for a spicy yet a tasty one. 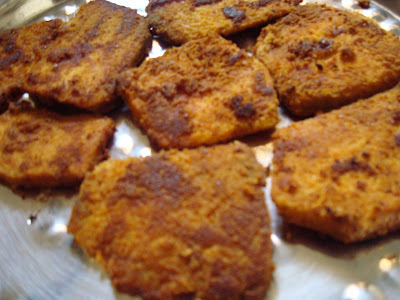 This suran absorbs the spiciness and also pretends to look like fish fry. Hope you all will try this out. Mix chilli powder,turmeric powder and salt well by sprinkling tamarind water. Remove the skin of suran . cut them into slices. Let it be little thick slices. Boil them in water till they become tender. It may take nearly 5 minutes. Now let it cool and apply the masala’s on it . Fry them in Dosa Tava with little oil on both sides till they get roasted.